This fantastic group of safety conscious contractors can be justifiably proud of their latest safety record. 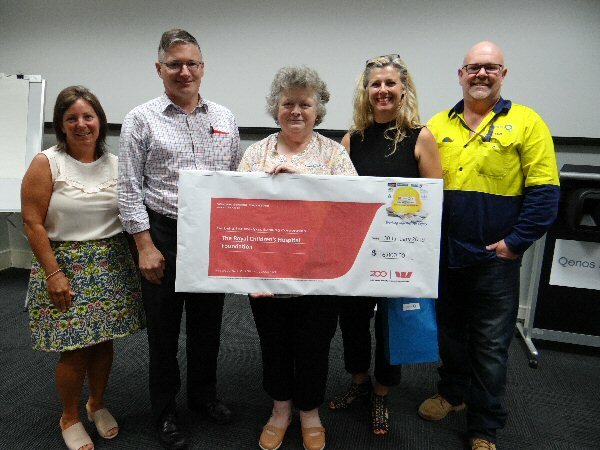 By achieving their collective KPI goals for the 2018 Fourth Quarter, a significant donation has been made to The Royal Children's Hospital Children's Cancer Centre. All on-site contractors attend the bi-weekly Altona 'Contractor Safety Talk'. At the January 30th session, several Safety Alerts were discussed including burns, faulty safety equipment awareness and working in extreme weather conditions - very topical given our current Melbourne weather. A highlight of the session was presentation of the donation to RCH representatives Mary McGowan and Donna Aranyi. Mary outlined a typical day on the Kookaburra Ward and the great work that is undertaken by the team of dedicated paediatrics specialists at the Cancer Centre. The Centre treats children from as far as Tasmania, Southern New South Wales and other states in Australia as well as taking children from overseas. The RCH is rated in the top five paediatrics hospitals worldwide. Accepting the cheque, Donna thanked the workforce for its significant contribution and spoke about how funds such as this helps the Hospital achieve its acclaimed medical status. She offered back a collective "big hug" to all involved from the children of RCH. Qenos and its contributing contractor companies are proud to provide the resources and finances for the contractor safety program. Mick Dwyer concluded the presentation by saying, "Our reward is that we have all been able to go home safely every day, to live the life we want to; not the life we may have to, if injured." He added "By achieving our KPI’s in Q4, we have the added bonus of being able to contribute to our community with this donation." In recognition of their safety performance, Altona Contractors with Qenos have donated to four different charities over the past 12 months.